Austin stood outside under the stars, away from the motorhomes, tent trailers, and tents. He’d gone out to pee but remained outside to ponder the beauty of the night, and the weirdness of the campfire talk earlier. That came with a chorus of “if he was would it matter?” from other family members. Austin was in his late 30’s and not married, cohabitation, or otherwise obviously in a relationship with a woman, or anyone else. It was cause for a lot of discussion among his clan. He called them a clan because they acted like it – one organic mass made up of loud and outspoken individuals who all happened to be related by blood and otherwise. Half of them were Vampire Hunters as well, a family trait that he couldn’t avoid and didn’t always love. The other half, including his 89 year old Granny, habitually too massive amounts of garlic tablets which made a chorus of farts and a lot of good nature laughing around the campfire. He was surprised there wasn’t an explosion. When he was a kid, maybe eight or nine, he’d gone on a camping trip with his Granny and Grandpa. In the middle of the night he woke and saw a dark shape crouched over his Granny. The next thing he knew the creature, who’d had it’s fangs in his grandmother’s arm, was spitting and coughing. It backed up out of the tent and fled into the woods. That was the first time he’d seen a Vampire. Since then he’d seen over a hundred of the things. Over the years he’d learned there were bad Vampires, and Vampires who were not. He’d learned that he had, not powers, but a built in intuition, or connection with the creatures. He knew how to control them, and scare them, and if necessary, kill them. Austin didn’t like to think about that, but he had to admit it was sort of a rush. A big rush. His phone vibrated. It was his girlfriend Elizabeth, the girlfriend he didn’t invite. He’d make it up to her later. She understood. After all, she was a Vampire, a fact that only his Granny knew. He read the message. Love you. Have fun. Love you. Miss you, he texted back. 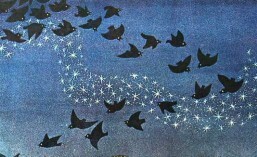 He looked up to the stars and saw a full moon and a whirl of small bats flying across the sky. In the distance he could hear the yip of coyotes, and the voices of owls. He felt a small hand take his. Granny was standing next to him. He looked at his Granny. She knew everything. “Of course,” said Austin. As they stood under the sky they watched the first light of dawn together. “Time for coffee Granny,” said Austin. Austin just had to laugh. Life was good. Click here for more about Austin and his girlfriend Elizabeth.